VERY cute 1000 square foot home built in 2005! Leave the front door and you are on one of the nicest beaches in Baja. Ahh, your own private paradise... The beach is white sand and the surf is normally non-existent (except in winter). Makes for great swimming in water from 71 to 94 degrees. Walk on the beach at sunrise, then come home and cook a big breakfast in your large, pleasant, tiled kitchen. Each bedroom is a master with walk-in shower. Plenty of shelf space in the closet area to unpack all your personals to make it home. Feeling kind of hot, are you? Don't feel like going in the saltwater again? Just step over to the outdoor shower, cool off, then lie right back down. Suddenly, all this outdoor living making you HUNGRY?...And isn't it about COCKTAIL TIME? Fire up the blender, then fire up the barbie and grill some of that fresh tuna you just caught. Maybe sushi or ceviche would be good, instead. And a great big salad. Yummm. And would you just look at all those stars! I feel a moonlight walk on the beach coming on... Now you're VERY tired, aren't you? Lucky you have such comfortable beds to sleep on. Then guess what? You have to get up and DO IT AGAIN!!! I know it's rough, but somebody's gotta do it...It may as well be YOU! Hurry up and get down here! We are located about an hour's drive north of the airport at San Jose del Cabo (SJD), at kilometer 103 1/2 on Mex Hwy 1. We are about 6 miles south of Los Barriles, which includes 2 miles of unpaved roads from Mex Hwy 1 to the property. On the beach, we are between Rancho Buena Vista and Rancho Leonero. The main grocery stores (Chapitos and Tienda Popular) and most restaurants are located in Los Barriles. Not much is in walking distance from here. Renting a car at the airport is the way to go. Most of the major rental agencies have offices there. On Mex 1, south of the airport in San Jose del Cabo, there are several giant grocery stores, Soriana, CitiClub, Walmart. Costco is in Cabo San Lucas, about half an hour south of the airport, also located on Mex 1. The bathrooms are identical with vanity and storage under sink, toile and tiled walk-in shower. Yes, it's really "right on the beach". Step off the deck onto the sand. There are Mini split AC units in each bedroom and its enough to cool the whole house. It is an open floor plan with the pantry, kitchen and living room open to each other for great friendship and entertaining. Full size Stainless Gas Range/oven. There's an ebb and flow of pantry items. Its a give and take in the pantry. Take all you want and hopefully give a little to the next guest to enjoy. Plates, Bowls, Glasses, Etc........ Basically all you need. 6 burner gas stove, coffee maker, coffee grinder, toaster oven, crock pot, rice cooker, sandwich maker, blender.........and all the pots and pans you need to enjoy cooking by the ocean. Table with 4 chairs to share a meal or 4 bar stools at the kitchen counter. Palapa-covered, 4 padded chaise lounges, table and six chairs. 3 outdoor ceiling fans. 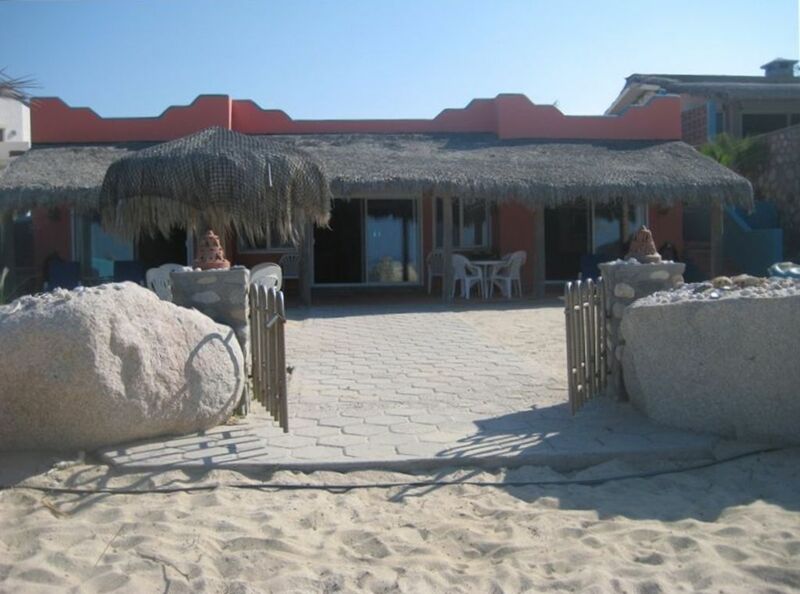 Amazing beach house just steps from the Sea of Cortez. Walk miles of quiet beach, swim in the mostly calm waters, watch whales breach, hear mantas slapping the water as they jump, see brown pelicans diving for fish, drive to town for great inexpensive dishes or eat at home in the completely furnished kitchen. The cassita has two master suites with separate baths. Kitchen and living room are shared. Wonderful covered patio with fans to watch the Sea and listen to the surf. Perfect vacation getaway. We enjoyed the 5 days we stayed here. Paula and DC are great hosts. The house is very beautiful, perfect for two couples, very well maintained and in a great location for any and all activities. Beach out front is great for swimming, fishing or just hanging out. We will be back. Ha! We had some laughs!! Sooo much fun! I can hardly wait to hang out with you guys again! It makes me so happy to make you so happy! Glad you enjoyed our little slice of paradise. Paradise on the Beach is appropriately named! Love the location. Just a few houses on a long stretch of undeveloped beach. And when you need more excitement, town is just 10 minutes away. Thank you for the kind review! We agree! Lol! Just a totally relaxing place to vacation. Everything that you need in a totally gorgeous environment. The hosts are great and very helpful with info about the area. Will definitely return. Can't say enough about how great Casa Paloma is. My husband and I spent six nights in this wonderful home. It is exactly as described and pictured in the listing - better actually. Truly a beautiful spot with comfortable seating outside to relax and enjoy the view. The beds are comfy and have stunning views of the ocean. This is the best stocked VRBO rental we have ever stayed in. They truly have thought of every comfort. Paula and DC are wonderful hosts; right next door if you need anything, but there is still plenty of privacy. The beach in front is wonderful and you can walk or ride ATV's in either direction for miles. Or just sit back and relax, fish, etc. And you get both the sunrise and the sunset! We wish we could have stayed longer and will definitely be back! Thank you Paula and DC! This place is a secluded paradise. The description and pictures really don't do it justice. The views are breath taking; the entire location is straight out of a Corona commercial. I really can't think of anything it doesn't have. The rate is a smokin deal. When you book, and the dates are blocked off on the Availability Calendar, you are confirmed.